Marvel fans have been losing their minds waiting for Thanos to rear his head once again after that brief tease in the end credits of Joss Whedon's The Avengers. The big bad flashed a big ol' cheese-eatin' smile at the end of that blockbuster, but subsequent films haven't even had a mention of the big guy. Now that he's allegedly showing up in James Gunn's Guardians Of The Galaxy, however, someone's gotta play the guy, particularly in later films. And it looks like one of the chinniest actors in Hollywood is about to fill that big purple face. UPDATE: In addition to the earlier story, which connects Josh Brolin to the role of Thanos in James Gunn's Guardians of the Galaxy, The Wrap now reports that Brolin also will play Thanons in Joss Whedon's sequel The Avengers: Age of Ultron. The source adds that Thanos "will have a more prominent role" in the Avengers film. Busy day for Josh Brolin's people. FROM EARLIER: Latino Review has scooped the world once again with their reporting that Josh Brolin will play the Mad Titan Thanos. The report specifies that Brolin will be "voicing" Thanos in Guardians Of The Galaxy, which means the guy is likely still gonna be shrouded in darkness in the coming film. The question is, is Brolin's casting foreshadowing an even bigger role in Avengers: Age Of Ultron? We'll have to wait to find out, True Believers! Is there going to be some consistency between the appearances of Brolin and Damion Poitier, who played Thanos in the post-credits sequence? And will Brolin be made up to vaguely resemble the Thanos we saw at the end of The Avengers? Or are we assuming motion-capture will take care of everything? Whatever the case, Josh Brolin's a pretty big get, an imposing presence who should be a major threat for the Avengers. It will be interesting to hear what the reliably-candid Brolin has to say about this, given that he's starred in Jonah Hex but turned down Batman V. Superman: Dawn of Justice. For those of you who don't know, Thanos hails from Titan, one of the moons of Saturn. He grew to develop an unhealthy romantic fixation with Death, to the point where he wanted to impress his lady love in a quixotic quest for affection. Mass murder on a global scale followed, as Thanos eventually became a ruler, a dictator, and one of the galaxy's most fierce, overwhelmingly powerful enemies. 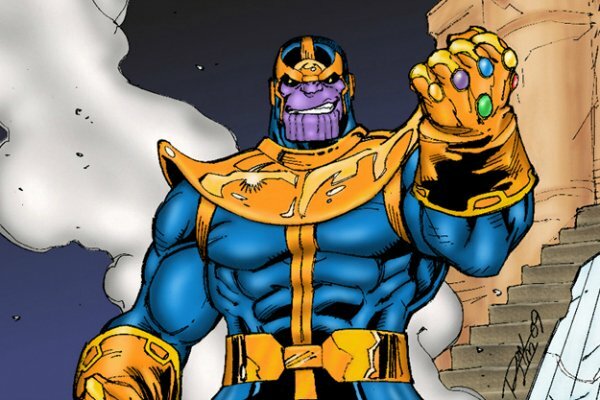 Thanos has shown an interest in the comics towards collecting the Infinity Gems in order to fully utilize the power of the uber-weapon known as The Infinity Gauntlet (which he is wearing above). Given that the Infinity Stones (as they are now called) factor heavily in James Gunn's Guardians Of The Galaxy, Brolin could find himself lusting after the universe's fanciest jewelery. It's not clear exactly how much was filmed for Guardians Of The Galaxy involving Brolin and Thanos (Drax, played by Dave Bautista, believes Thanos murdered his family), but if Latino Review is right, the Marvel universe just added a pretty big heavyweight.